Andrew Gibbon Williams describes this as a Café Royal scene with Augustus John central, seated, and Jacob Kramer in animated conversation with the two standing figures (Williams, William Roberts, p. 62, where the picture is titled Discussion in a Café). In his memoir 'The "Twenties"', Roberts noted that 'The Café Royal in Regent's Street [sic] was the favourite meeting place of the artist and bohemians, where they could sit the evening out sipping a mezzo-grande or an absinthe, and await the arrival of Augustus John and his two stalwarts, Ian Strang the etcher and Horace Cole the practical joker' (William Roberts, Five Posthumous Essays and Other Writings (Valencia, 1990), p. 136). 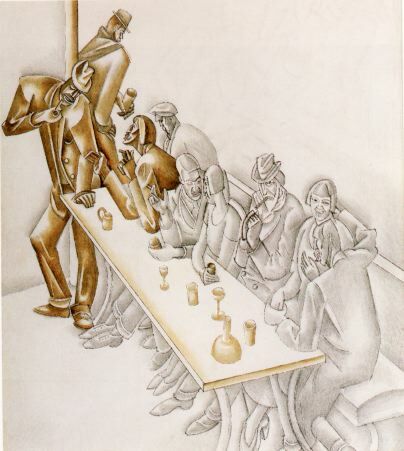 A study for this, Pimps in a Bar, includes a bar counter and additional figures at the rear.